When we bought our property more than 20 years ago, we inherited an amazing architectural gem: A fachwerk barn. With hand-hewn beams, rough, weathered bricks and bent, rusty nails, it’s a photographer’s dream. My limited skills, however, could never quite capture its essence. Now I’m learning to see things differently. There’s art everywhere we look and sometimes capturing the parts rather than the whole can be very intriguing. I’m still working on texture assignments for my photography class and this shot came up with texture galore. 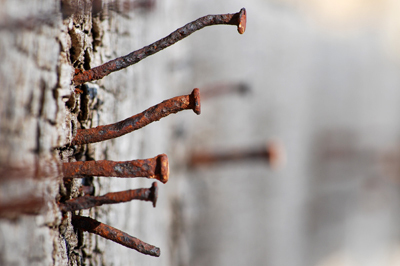 The nails are the old, square kind; possibly handwrought in the early to mid-1800’s. And the ragged chunk of wood is part of a large beam separating brick sections in the fachwerk design. I like how the viewer’s eye is drawn back and away. My mind does the same when I think of days gone by and the work that went into handcrafting the nails and timbers of this barn. Simply awesome. Will people ever say that about the work we do today?